Happy first weekend of spring! ARTECHOUSE is celebrating many things with its newest digital art exhibit: Cherry blossoms, spring, renewal, and women artists! 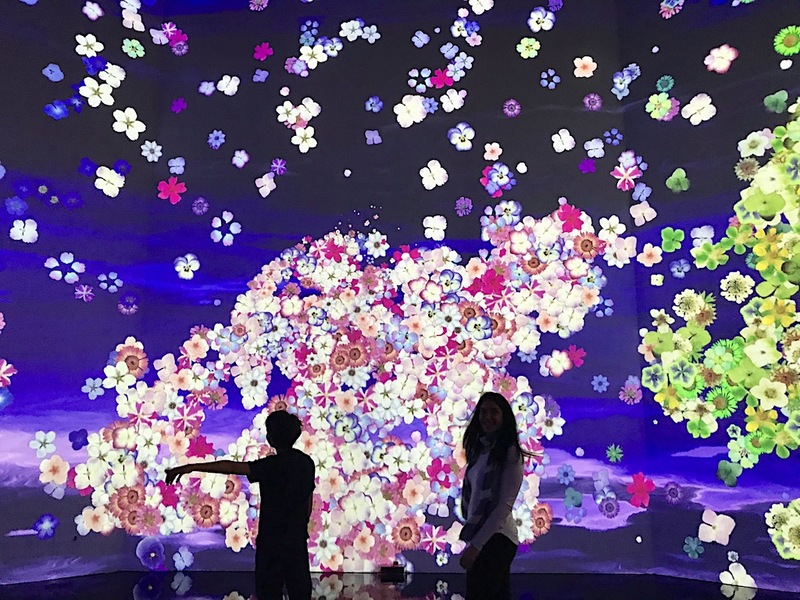 In Peak Bloom features interactive and immersive digital art installations inspired by the fragile beauty and ephemeral nature of the cherry blossom. The works are beautiful and delightful, unique and profound. They’ll have kids and adults alike smiling and appreciating the gifts of art and nature. When: Saturday, 11:30 a.m. – 3 p.m.
Join the American Art Museum and the National Cherry Blossom Festival for a celebration of Japanese culture. Kick off the day with a taiko drumming performance outside of the museum at the F Street entrance. Enjoy face painting, make cherry blossom crafts, listen to Japanese music, and go on a spring-themed scavenger hunt through the museum’s galleries. This is just the start of many cherry blossom celebrations over the next few of weeks — plan for more with this post listing the activities families will enjoy best. Children of all ages and their families can learn about Japanese culture through reading, writing, and craft-making with Japanese cultural and linguistic professionals. Japanese-related books will be on display, and a special highlight of the day is “Japan-In-A-Suitcase,” an inspiring program about Japanese life and culture. Other activities include Japanese drum music and dance performances, instructions on the art of tiara-making by former Cherry Blossom princesses, origami artwork lessons, decorative Konobori coloring, and the kimono dress-up experience. Children can also explore the Library’s Young Readers Center, which is full of current and classic children’s literature – read more about it here. Spider Man, Iron Man, Captain America, Thor, Black Panther, Hulk, Black Widow, and the Guardian of the Galaxy…Marvel’s mightiest heroes face off against some of the most threatening villains in the Marvel Universe. In this live stage production, see them unite in a race against time to defeat Loki in an epic quest to defend the universe from evil. It’s slime time at SLIME EXPO DC, the DC metro area’s largest slime event! The fun-filled day will include meet & greets with your favorite slime brands, live demos, slime recipes, raffles, giveaways, DIY slime workshops, contests, a trade area, and many more slime-related activities! The Mount Olivet Preschool is hosting their annual KidStuff Sale! Shop for a HUGE selection of gently used items. There will be children’s clothing (sizes 0-6+), maternity clothes, baby equipment & accessories, strollers, toys & DVDs, books, and furniture. Go early to score great deal — and bring a friend! Cash or check only. Parking is available in the lot located off Glebe Road next to the church. Witness death-defying feats of aeronautics — well, model aeronautics, anyway! The DC Maxecuters, a club for model aviation enthusiasts, have been sharing their love of model aviation in the National Building Museum’s Great Hall for over 20 years. Don’t miss this opportunity to watch them send both rubber band- and electric-powered model planes soaring between the 75-foot columns and overhead. And this will be the DC Maxecuters’ last year of Flying in the Great Hall, so this is a chance to wish them clear skies and safe landings in all their future travels! This weekend is your last chance to experience the Big Apple Circus while it’s in town. Celebrating its 41st season, the show features amazing stunts under the big top. Known for its one-ring, artistic, European-style, no seat is more than 50 feet from the performers. That’s perfect for viewing some first-ever featsalong with fan favorites. Hire wire acts, contortionists, bicycle acrobatics, hilarious clowns, and doggie dances are some of thrills and fun you can expect. Read a review of one of our past experiences at a Big Apple Circus show. Celebrate Women’s History Month at the DAR Museum! Join us to recognize powerful American women who left their mark on history. Come learn about your favorite heroines and discover some new faces as well. Enjoy activities, crafts, games, music, and a preview performance of 19: The Musical from 12pm-1pm (seating for that is first come, first served). * Reserve free tickets to a musical adaptation of Jack and the Beanstalk, this week’s Saturday Morning at the National performance. * See The Watsons Go to Birmingham–1963 at the Kennedy Center. * Dicken’s Davy Copperfield is on the Imagination Stage. * Anatole: Mouse Magnifique is also at the Bethesda theatre. * Watch Rapunzel let down her hair at The Puppet Co. for one last weekend. * And Teddy Bear’s Picnic is the featured Tiny Tots performance there on Saturday. * Spend Saturday morning with The Great Zucchini at Jammin Java. * Venture Into the Woods at Ford’s Theatre. Several local bookstores around the area host free story times for children on weekends that often include more than just a reading. Head to Hooray for Books in Old Town Alexandria on Friday or Saturday for story time from 10:30-11am. Solid State Books on H Street NE hosts readings on Saturday (ages 0-5) and Sunday (age 4+) at 10:30am. At Kramerbooks in Dupont Circle, they’ll watch your kiddos while you grab a coffee on Sundays at 11am. Catch Sensory-Friendly Screenings of Captain Marvel and Wonder Park on Saturday morning. The newest My Way Matinees from Regal give everyone the opportunity to experience a movie once a month with the sound turned down and the lights turned up. Watch the trailer for Captain Marvel here and Wonder Park here. You’re invited to Storybook Theatre — dramatic interactive readings of children’s books! This is presented by Royal Proteges for a group that offers supplemental education focusing on success, finance, and leadership to youth and young adults. Seating is limited so register in advance. Delight your friends and family with this crowd-pleasing talent! Join professional balloon twister Julie Zauzmer for Balloon Animals 101. You’ll learn the basics of balloon twisting, from balloon selection and sourcing to twisting mechanics, and you’ll walk away with 3 of your own balloon animals! For ages 5+. Kids must be accompanied by an adult. Get a dose of nature, enjoy spring weather, and have some active fun on the trail! See buds getting ready to bloom, tramp in places with scenic views, hike and explore history at interesting locales, and savor the time outdoors. This post has a bunch of recommendations for great places to walk in the woods with the kids. * There’s a new post listing live entertainment for families coming to local stages this spring — check it out and save your seats! * A good list of places to watch March Madness, some even kid-friendly. * Prep for peak bloom with Tips for Families Viewing the Cherry Blossoms. * And check out cherry blossoms around the world! * Next trip to NYC, this is a must-do. * Date night at the Zoo? Tickets for the annual Zoofari are now on sale. * Along with the outstanding fare, another reason to love Rose’s Luxury.